The Noble Ultima in its post - 1987 revamped guise, was taken over by Ted Marlow in 1992. This was a serious supercar, with engine options extending up to mid-mounted small block V8s. Options included carbon-fibre bodywork, Tig-welded chassis, various suspension packages, and a Porsche 5-speed transaxle in place of the ususal Renault item. A MK4 model, developed with road use more in mind than competition, and a cheaper roofless Spyder model also became available. 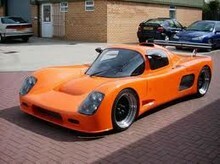 McLaren chose an Ultima chassis to test components for its F1 road car programme.